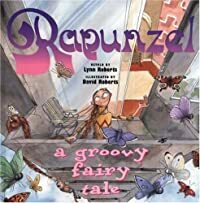 This entry was posted in Books and tagged 1970s, A groovy fairy tale, David Roberts, Lynn Roberts, Rapunzel by Katrina. Bookmark the permalink. This sounds great and there is one for Sleeping Beauty (1950s). Just what I need, more books. But I love illustrated books. Yes, there’s Cinderella too I believe. I love good illustrations too.